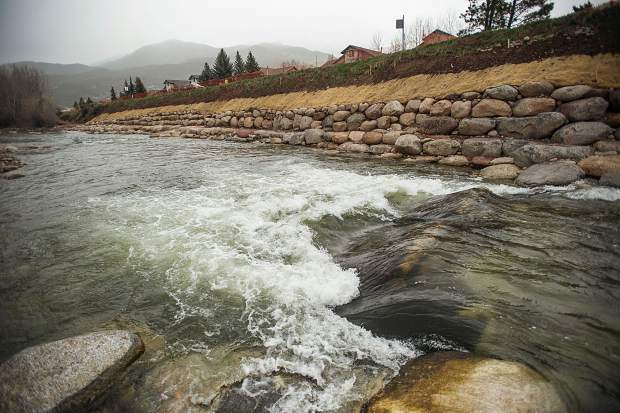 Completed in early 2017, the Basalt Whitewater Park consists of two waves on the Roaring Fork River. As of this writing (4/24/17), the river hasn’t seen flows high enough to surf, so the jury is still out on whether the features hold any promise for river surfers. News reports suggest the features were built with kayakers and SUP paddlers in mind, but it’s hard to tell at this point what flows will be surfable. Early reports suggested that some modifications were done to the park after the initial round of high flows resulted in flat holes with long, retentive backwashes that looked more like low-head dams than surf waves. As of early 2018, I haven’t seen much suggesting a lot of promise from a river-surfing perspective, but maybe the modifications have done some good. The Roaring Fork near Aspen should give a barometer of the flows; the nearer gauge (Roaring Fork near Emma) is below the confluence of the Fryingpan and likely won’t give as good of an indicator. From the looks of things so far, higher is better. Want flow alerts for the Aspen gauge? Sign up here. The new park is located above the confluence of the Fryingpan, off of 2 Rivers Road.